Good Sunday afternoon! A surprise came this afternoon – RAIN! Of course we have been under a High with 75-79 degrees in the morning (early) with 100% humidity – Walk – NOPE! Not until the humidity and dew points become lower! Hopefully the cool front coming in Tuesday evening will begin the cooler weather and I can walk each day! I have finished sewing all the blocks together of York Lodge! I will be adding a 1” border to frame the quilt and a 3” border to complete it. I have decided to use a dark purple and a light lavender for the 3” border. 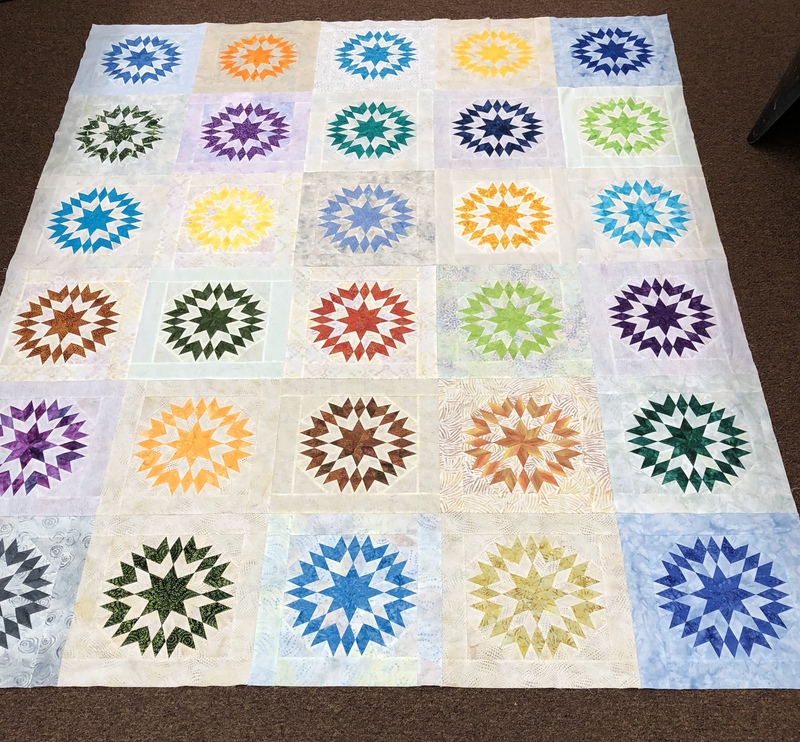 I was so happy to complete this quilt top and I do believe my body is glad! The stress that I put myself under to do this “challenging” quilt was well worth it. After pushing on a project it usually takes me a week to ‘relax’ and start another UFO. York Lodge Blocks sewn together! It made me feel so good that they took the time to comment! I do hope they are pleased with the top when I have completed the borders! I have been working on Block 20 of A Bountiful Life – NO I only have 6 blocks completed it is one of the blocks that I had prepared last year! The rose buds it will make the block. For some reason I chose a light and dark brown for the bird. I may revisit that choice as the green is very dark I think that I may make the bird a different color. I have now changed my mind on Brinton Hall and decided to continue on with Mountmellick and not just add a border to make a wall hanging! 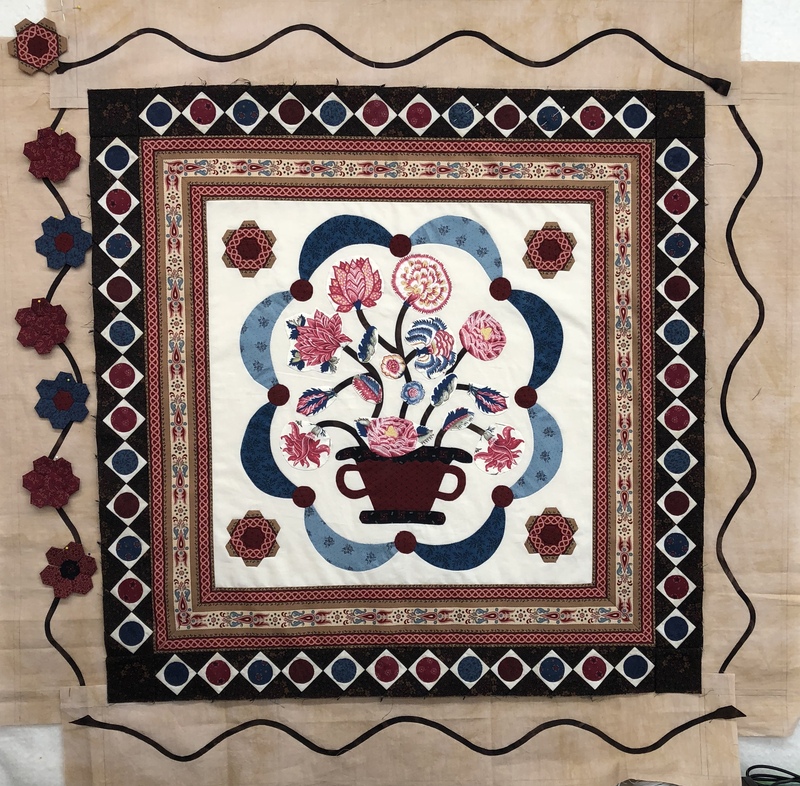 I am now going to make the flowers for the border, but changing the flowers to blue with a red center and not the red flowers with a contrasting center. The corner flowers will match the flowers in the center medallions and they will be intermixed with my blue flowers. I am going to dedicate my day sewing time to finishing the flowers this week. Then the remainder of the quilt will be the different borders that will be pieced! Just could not stop with Mountmellick! Looks like fun! Hope to be through this week with the flowers. On 28 Sep we went to the Austin, Texas Quilt Show. This is the Best of Show. 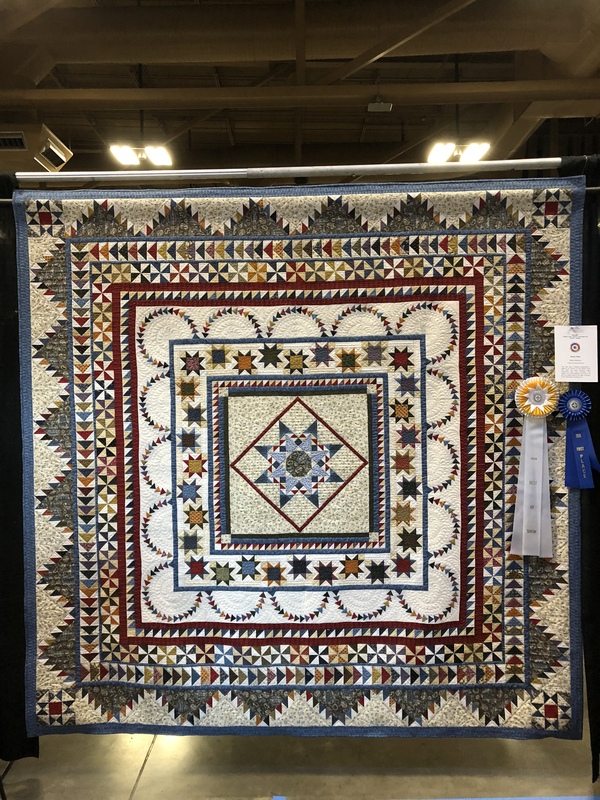 I was so happy to see this quilt won! It is a Sue Garman quilt pattern and done very well. There was one issue that my eye immediately went to and it was on the left red border. It was either the long arm quilters mistake, or the top was not square. Either way it did not detract the beauty of the completed quilt. It is not for the faint of heart also! Cudo’s to the maker of the quilt! Well, I do believe I am caught up on my post for the week! Hopefully this week I will have completed my flowers and Block 20 will be an easy finish – not difficult at all! (Especially compared to York Lodge – of which I am almost ready to ‘check out’! ← Progress Can Be S-L-O-W! Thank you so much Sharon. Have a great week! How absolutely beautiful! It looks very challenging. Thank you so much. It was a challenge! Your York Lodge is stunningly beautiful. What an amazing stitcher you are! I am fascinated by your hand applique…..so lovely. As for the “Best in Show” quilt; my beady li’l eyes would just get lost in all that astonishing detail. What a masterpiece it is. Thank you Kim for the nice comments. The quilt was extremely well done! The borders are perfect! The dark is so rich and the lighter border still has enough weight to carry the whole quilt. 👏🏻 Those hexies are so soothing to make, that’s probably what you need after York Lodge!!! The BOS quilt is beyond belief! There is so much to look at, ad then you suddenly realize how intricate some of the shapes are, yikes! Enjoy the cooler temps, we are in the 30’s much if this week, then a week of 50’s again, hopefully we’ll have enough nicer days to get all the outside work done. Can I come stay with you??? I want cold weather! So tired of the heat! Thank you Kathy. I will try to have more hand work done next HQAL! Sounds good to me!!!! LOL. Summer with you. You can come here for winter when it hits -25! I’m so sorry we missed your email. darn technology sometimes! We did send you an email after you left a comment on our Blog so not sure what happened there. I am pretty bad with keeping up with blogs also. Need a few extra hours some days for social media lol. 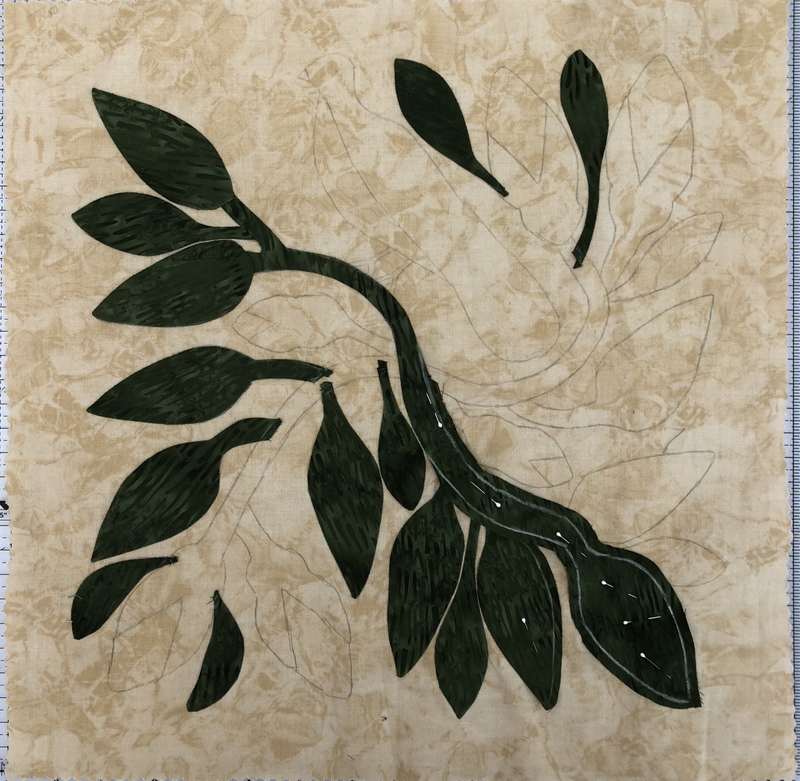 Will you be going to Houston Quilt Market? If so would love to meet you. You can email me starshollow@iprimus.com.au. I’ll definitely get that email. Love your border choice too. Like the purple border you chose. We are getting some rain and cooler temps. OH send the cool air here! I would love to come to SV this winter! We might make a trip – need to find a place to stay for a week. Doug and Jean are heading that way – they are in the 80’s and 90’s and not doing that well. We would like to visit with them one more time. Thx for the comment on the border! I was going to go with a dark one, but then I realized that a dark would override the stars and i did not want that! Loving the York Lodge! You have make great choices for it! I also think that it as a great choice to continue on with Mountmellick. I do believe that you have got your quilting mojo back! I am on vacation this week…headed to a lodge at Mt. Rainer…no internet, cell, or tv. I am so looking forward to this! It will be cool and probably wet…I believe I will like my weather better than your’s. Ha, ha! OH – no TV, phone, internet – You know, maybe I need to turn them all off for 1 day a week. I know that I had to get off the computer and blogs in order to stay focused when making YL. There were days when I wanted to sell all my fabric and get out of the hobby – Hubby always laughs at me when I get that way! Enjoy that vacation – taking any hand work, or taking a break from quilting also? Yes, I do have a handiwork project as well as a novel with me. And I I intend to hike and breathe in Mother Nature’s glory. York lodge is a stunning quilt! Well done! With all those angles I can see why things may not have went as smoothly as you wished, but the end result looks flawless. Thank you so much – Lots of 45 degree angles and diamonds. All intersections on the 1 1/2″ strips had to be perfect. I am sure there are a few that might be off 1/16th of an inch and hoping the judge is blind when the judge it – LOL! You are really getting so much done, and all of it lovely! That BOS quilt is amazing! Thank you for sharing it. Love your purple border! I think it’s perfect for the quilt top. I was so happy to finally see a Reproduction quilt win! The modern quilts are just not for me and some of the shows – like last year in Dallas – had the Modern quilt as their BOS – UGH! Have a great week! Surprise rain yesterday! More today. Looking forward to cooler weather! Your stars are stunning and I love the choice for borders. Your hard work shows and the stars are lovely. I like the arrangement of color too. Good job. The quilt that was best of show is lovely too. So many amazing projects on the go in your sewing room! Love York Lodge! And the hexie flowers are so pretty! Thank you Kathy – I do not know how you can work on so many projects at once! Although it does keep you on your toes and change is good! Thx for hosting Slow Sunday Stitching! York Lodge just sparkles….like diamonds! The simple purple makes the ideal frame. Any hexie project catches my eye. And a quilt show, too. What a great week! Thank you Nann! It was a fun week! 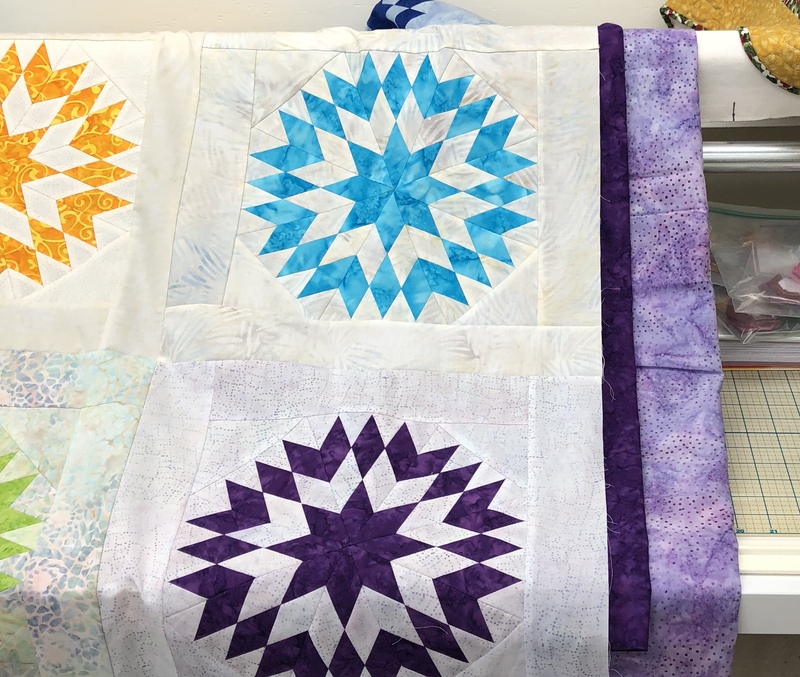 Especially since I had finished all the blocks a few days before the show and then last week I finished sewing all blocks together. Taking a few days before I tackle the borders! Have a great week! York Lodge looks so awesome! As does everything else. Your perfectionism has certainly paid off. Good to see you doing so much sewing and making good progress on your quilts. Your work with the diamonds was a challenge but done so well in the end. Always good to hear from a pattern designer to know that they appreciate your workmanship. Doesn’t it feel great to look at this beauty after the stress of a good challenge! Congratulations on your finish. Hi Kathi, Yes it does feel good. I took a little time off before I do the final borders! Working on my RSC 2018 finish! Thanks for the nice comment! ooo – yes, I really love the purple/lavendar combo for the York Lodge borders! Your Mountmellick center is so gorgeous, it’s very nice to see that you’re going to continue it – love the change to blue flowers. Thank you so much for the lovely comments! I am getting ready to put those borders on today! Wow Nanette! It’s beautiful! And I love your border choice – it works so well with all the different colors. Congrats!